If you've got your fingers in many pies, then you're pretty much assured at least one will prove to be cherry...wait is that your pinky?!? That's not a finger at all! Swapping a non-cherry pie for one he hopes will be, the guy behind American Tap Room. 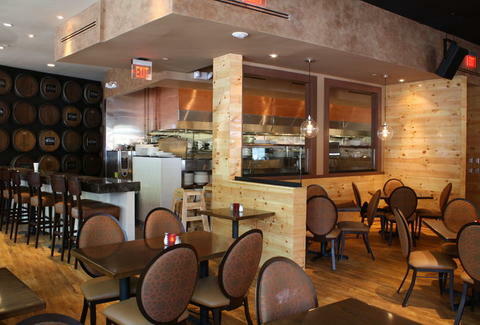 From a multi-chain-owning restaurateur who wanted a new concept in his Austin Grill, 200-seat Tap Room's a brighter, more geographically relevant version of their Reston location, with a light pine interior, copper wall casings/two-way fireplaces, and an entire whiskey-glorifying wall covered with barrel ends sticking out, just like the trench coat of that kid you always make fun of...oh no! The food's comfort-y, with traditional eats like a 6oz filet mignon in red wine sauce and cipollini onion, and lightly seared tuna sashimi with togarashi ginger sauce, plus more inventive bites like a spicy jerk chicken spring roll, gruyere/fontina lobster mac and cheese, and bacon/sherry vinegar calf's liver, which will be totally delicious, unless a desperate Mickey Mantle decides he wants it. Because Americans occasionally enjoy alcohol, the tap room'll be offering 50 wines by the glass/bottle, plus 50-ish beers including taps like Smithwick's and Dogfish 60 Minute IPA (all available as a pint, "tall", or part of a four-beer flight) and a craft-heavy bottle list boasting Abita Turbodog and Oregon's Drifter Pale Ale, which you might as well just kill -- no one will ever know! For your entertainment needs, weekends'll see all manner of games cast on their 16+ flatscreens, plus local jazz studs tickling the ivories on their 20k baby grand -- because if there's one thing that's obvious, it's important to take care of your pianist.